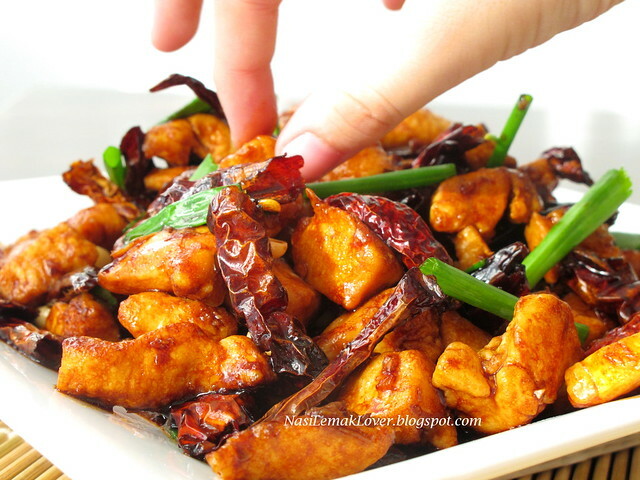 I like to order Kung Pao Chicken (宫保鸡丁, Gong Bao Ji Ding ) when we take meal at Esquire Kitchen restaurant (personally i feel they serve best Kung Pao chicken). At the same time, I also like to cook this dish at home, and this dish is easy to prepare and yet very delicious..
Usually i will add cashew nuts but when i saw Terri (A Daily Obsession) added peanuts to this dish. I agreed with Terri, peanuts is far better than cashew nuts after i tried out..
Eventhough i added 1 cup of dried chilies, my little son Desmond has no problem to take this yummy dish. 1. Cut the chicken meat into small cubes, marinate with the ingredients above for 1hour or more. 2. Mix the sauce ingredients in a small bowl and set aside. 3. Heat up a non-stick wok over high heat with 1 cup of cooking oil and lightly fry the marinated chicken until they are 80% cook (1-2mins). Drain out and set aside. 4. Remain around 5tbsp of oil, add in Sichuan peppercorns and stir fry over low heat till aroma. 5. Discard the fried peppercorns, add in dried chilies, fry over low heat, until crisp but not burnt (color changed to dark red). 6. Add in white part of spring onion, chopped garlic and ginger, quickly mix well. 7. Return cooked chicken to the wok, pour in the sauce, stirring all the time at high heat. 8. When the sauces is thickening, then add in green spring onion and peanuts, quickly combine well and dish out. My all time favourite... i just ordered this dish during lunch time! savory enough to go with bowls of rice!!! Bookmarked! I love this kind of Chinese food that I can eat a lot of white rice. I'd be so happy with these two dishes. 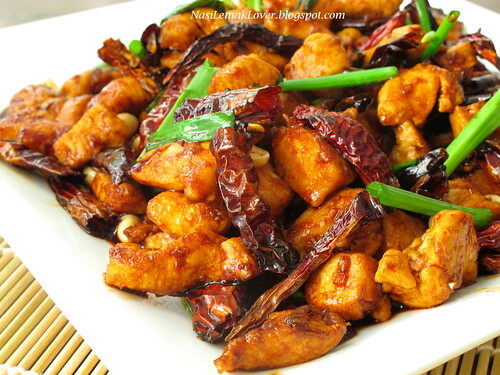 :-) Your Kung Pao Chicken looks like the best looking ever. YUMM! hi, Sonia, it's one of my favourite dishes at Esquire Kitchen too, it didnt occur to me need to add tomato ketchup, so does it taste like the "E"
restaurant ?Must try one day. I love cashew nuts in the dish too. 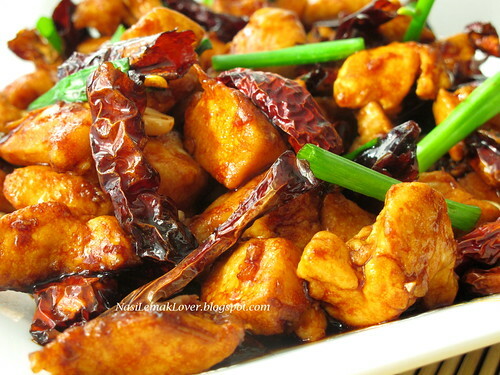 We call it cashew chilli chicken! Love love love it. Yours looks truly delish. This is what I want to learn. I like it. So good to go with steamed rice. This is a must order dish for us too if we eat at Esquire Kitchen. We love eating it with their flower buns. Yum!!! I could eat that right now. 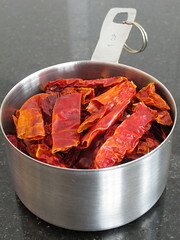 I just bought a big pack of dried whole red chillis, so I know what I'll be putting to use with them! :) Thanks for sharing. so long dint hae this already. Sonia, u really a good cook. This looks just like the one serve in restaurant. Thumb up! peanuts hey?? I shall try it out next time! 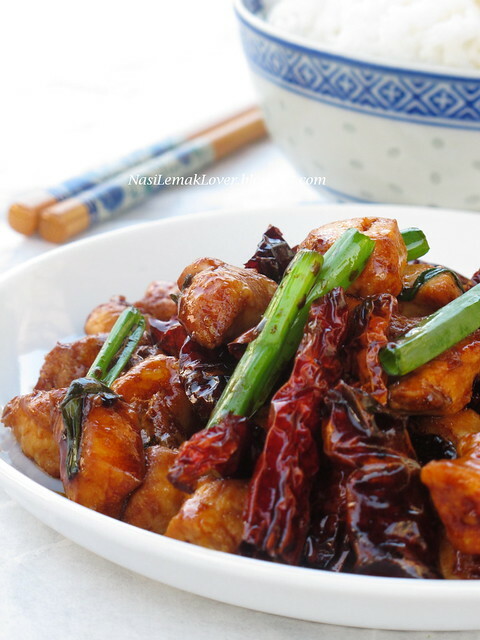 i've cooked kung pao frog and squids but still it didnt get the right taste as it should be! i want to give this recipe a go! thanks so much for sharing, sonia! my favorite too, yours looks delicious. I want to steal a piece or two too! :D Can't resist this dish, you cook it so well! Oh, Sonia! This looks wonderful. 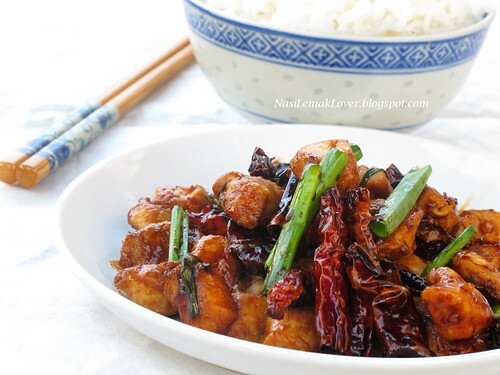 My husband adores Kung Pao Chicken. After looking at these pictures, I suspect that I might adore it as well. Fingerlicking kung pao chicken. Drooling here.Beautiful clicks!! Yummy! And I totally agreed with you that Esquire Kitchen serves the best Kung Pao Chicken. Wonderful and temptingrecipe. Looks yummy and delicious. This is one of my favs looks delicious. i love to eat this, but dun know how to prepare the sauce. Thanks for sharing. Cm dah pernah cuba resepi kung pou ni memang yum yum!! Really very good with steamed rice! I seldom order this outside cos it always turn out greasy when they cook it outside. Looks wonderful! Yum! Thanks for sharing. Anonymous, you can get this pepper from the Chinese herbs shop also called as "yuk choi poh". So much better to make at home than ordering out. Yours looks very delicious and professional. Sonia, this is very delicious. OMG, My first visit of your space with Delicious chicken. Your picture is making to prepare this recipe. Love your space. Can I have a bowl of rice with this??? Kung pao chicken from scratch..you are really a great mummy!!! Mmmm....spicy and delicious.Love it with rice. Esquire Kitchen IOI Mall Puchong is one of our favourite dine out! We'll always order their Chicken Paprika with cashew nuts. My my...just salivating think of it now. Wow, looks delicious! One of my favourite dish! I prefer it with cashew nuts though, though I won't say no if it has peanuts in it! thanks for sharing the recipes..so yummy. Will try this recipe this weekend. This looks so good! One of our favorite dishes, but I've never attempted making it at home. It sounds like one I can handle though. Thanks for sharing! that looks sooo good! recently reposted an entry about chinese stirfry tips, and yours is a perfect example of a stirfry done right! Nasi Lemak bungkus, one more please! King of soy sauce prawn, Encore ! !